Neurofeedback is a method of brain training. It refers to a process whereby the brain and central nervous system (CNS) receives feedback about its own activity. 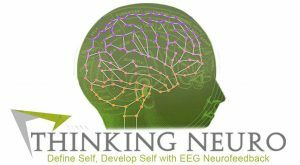 This gives the brain the opportunity to change inefficient patterns that have developed over the course of a lifetime and even as the result of multigenerational family patterns of reacting to internal and external stimulation. Neurofeedback trains the brain to become more flexible and oriented to the here and now, instead of stuck in rigid patterns. Brain activity is measured by sensors that are placed on the scalp and ears. 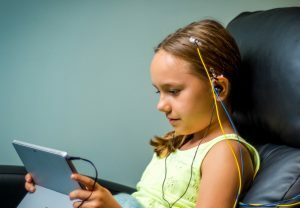 These sensors read electrical activity generated by the brain and CNS while the individual is also listening to music. Very brief interruptions in the music are generated as the “feedback”. These breaks are triggered when the neurofeedback software program detects the brain shifting from one state to another. The brain uses this information to learn new patterns of reacting that reflect increased flexibility and more of a here-and-now orientation. Relaxed training: Listening to the music and watching a computer-generated image or just closing eyes and meditating or dozing. Combining relaxed and active training may be the most efficient way to reach an optimal number of sessions. Why does Lorna use neurofeedback as a tool in her therapy practice? While Neuroptimal® neurofeedback has empirical evidence supporting its effectiveness, there are no guarantees, particularly regarding specific results. Many neurofeedback users report improvement in their initial concerns. What also tends to happen is that users experience unexpected benefits that add to overall quality of life. My role as the trainer is to empower you to notice what training changes in your reactions, perceptions and behavior. No one can predict how many tennis, piano or golf lessons someone will need to become proficient because very person starts at a different place and has different goals. The same is true for brain training. Training on the equipment takes 33 minutes. Appointments are 50 minutes, whether for relaxed or active training. Discounts for pre-purchase. Refer a new client and receive a training session for free. Contact me for more information. There can be no human error. a. Other forms of neurofeedback involve the trainer “diagnosing” the problem and gearing the training toward specific areas of brain activity. This can result in side effects. Other methods also ignore the fact that brain activity is highly variable from moment to moment and over time. Neuroptimal® responds to the brain in the here and now, with every session uniquely based on what is happening in the moments of training. b. Every trainer uses Neuroptimal® exactly the same way, every single time. Nothing is going into the brain. The only intervention is the information the brain receives about its own activity via minute interruptions in the music. Neuroptimal® is brain training, not treatment for disorders. People commence training because there is a problem they want to address. However, the specific problem is not relevant to the training. Neurofeedback is oriented toward peak brain efficiency, no matter the presenting issue. Absolutely. Children often respond quickly to brain training and it is completely safe for every age. Sleep problems, headaches, digestive difficulties, anxiety, and attention/focus are known to respond favorably to training. Children also benefit from having parents who train their brains! Lorna received her license in Marriage and Family Therapy in 1999 and has maintained a private practice since 1995. She has participated in advanced training in Bowen Family Systems Theory since 2006. Lorna attended Southern California Training in Bowen Theory from 2006 - 2015 for individual coaching and group consultation, and the Postgraduate Program at the Georgetown Center for the Study of the Family from 2012 - 2015. Lorna sends out a quarterly newsletter and blogs regularly about applications of Natural systems theory.